Hey, this blogging lark can have its perks. The Tazartes' LP is a Lynchesque dream record, a delirial wash of backwards speech, muslim prayer wail, church bells, drones, primitive drum machines and proto-synth. You're reminded, fleetingly, of Stockhausen's Hymnen, Neubauten, early Cabaret Voltaire, Mark Stewart circa As the Veneer, even Funkadelic's Maggot Brain. Transports ought to be fragmentary and dissipated, a haphazard juxtafest of incongruous elements, but it's just the opposite. It has a compelling consistency lacking in the dessicated, academic noodling of so much of today's Wire-type experimentalism. You want to keep listening, and when it finishes, you press 'play' again. 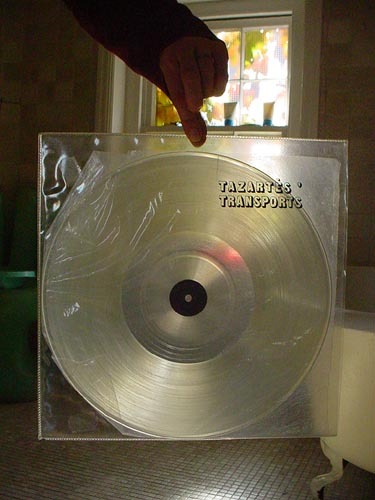 Transports is at the darker pole of uneasy listening, queasy listening, which is genuinely ambient in that it brings into play the sounds of the listening environment. It's like a dream in that transient sounds becomes incorporated into the experience. Matt thought I'd like it, and I do. In its mood, the Goblin record is not so far from Transports. It's everything one hoped Prog could be, but, in my limited exposure to it, seldom is. Goblin have what most Prog I've heard doesn't: a depth-plumbing bottom end, a bass that coils and rears like a giant cobra. (Incidentally, what much Prog has in common with Regressive Rock is a disdain for, or indifference towards, rhythm.) Suspiria isn't some steroid-bloated inflation of rock, a prolongation of rock by other means. The instrumentation and the mixing don't reflect rock's trad priorities. Yes, there are guitars, but not as lead instruments. In fact there aren't really lead instruments of any kind here. Woozy kettle drums, rasping semi-audible whispers, trance-inducing percussion, multi-tracked chants, swooping moogs: the first side is a masterpiece of sustained threat, mustering all the tension that Prog typically throws away in its ostentatious determination to showcase virtuosity. This Suspiria record, right, this is the actual soundtrack to the Dario Argento film 'Suspiria' isn't it? And didn't Dario Argento have a prog group called, uh, Goblin, who made soundtracks for films, most of which were made by, erm, Dario Argento? I love that film like dawn, nylon and scary masks and one of the great things about is...the music! Yes, that's right, Oliver. (Cringes in shame) I haven't seen the film, I'm embarrassed to say! 'Solamente Nero' is worth checking out too. The music was written by Stevio Cipriani but performed by Goblin. It's half oscillating transylvania synths and half songs (most of them under 2 mins), many of which are basically revisits to the same horror disco themes that get more fried and dubbed out each time.